The first piece, One Man’s Show, consisted of a performance of the infamous Hamlet’s speech “To be or not be…” viewed from four different seats at the theatre and consequently four different perspectives. We are led in Mamoru’s journey of self-fragmentation through the different projected images of himself. These eventually rebel to the process of imitating the real live performer taking on different activities and inclinations. In the end we understand that even in viewing, this is truly a one man’s show as the audience seats are revealed, through a camera, to be empty. 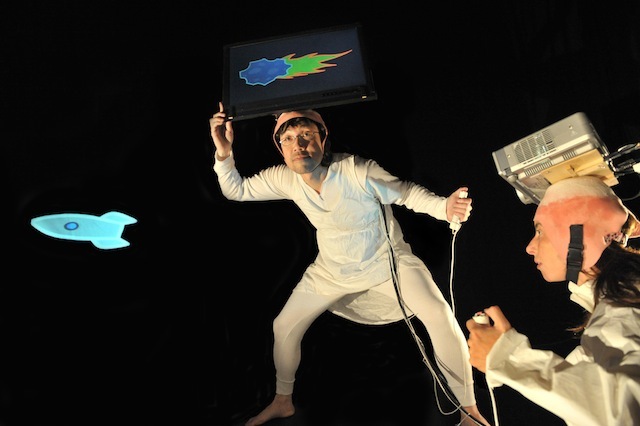 In the following piece – Projector/Conjector, the two performers, Mamoru and Selina Papoutseli, literally carry on top of their heads a flat screen TV and a projector. Here technology features as an extension of their bodies that are taking the roles of the opposite gender. They embark on a peculiar journey of love and conception to the soundtrack of Tchaikovsky’s Swan Lake. The inclusion of cross-species relationships in Mamoru’s work (in this particular case the relation between a woman and a swan) makes me wonder whether it stems from Mamoru’s background and interest in zoology or if it is another tool for breaking the set rules and conventions regarding identity. For Mamoru’s work is a permanent question mark on the matter of identity. He uses the most classical pieces that debate around this same issue – the quest for identity in Hamlet and the mistaken identities in Swan Lake – but he delivers these in the most unconventional way, shedding a new light on these pieces. The last performance, Graft, once again manages to cause some giggly reactions in the audience as the drama stems from the spillage of coffee in Mamoru’s house causing a black flood that invades the seven computer screens on stage. Gradually, through ingenious interactions with the computers, Mamoru poetically abandons his body parts in the computer screens in order to become bodiless and explore the freedom of endless possibilities. He dances in his awkward unbalanced way, undistinguishable in the midst of the coffee mixture.